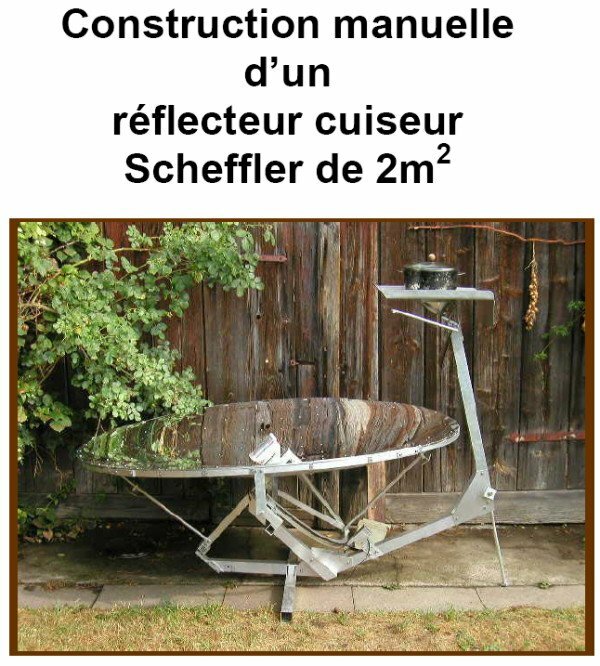 Manual construction of a reflector solar cooker Scheffler 2m2. Cook with the sun will give you pleasure! This document 56 pages explains step by step how to build a solar cooker with parabolic concentration of high quality. flammable material must be present. - Do not look where concentrated light, eg on steel damper. Use sunglasses! - Close the valve before removing the pan from the venue box to protect your eyes. - Install the cooker in the north-south direction with the help of a compass. The cooking area should be north and south reflector. - Put the solar cooker flat, which means that the cooking place is upgraded by adjusting the telescopic leg and the second leg. - It is advisable to fix the solar cooker to the ground, so that it is not overturned by the wind. - To move the reflector around its rotation axis towards the sun, the tracking system will align exactly. reach the closed control valve. Now tighten a telescopic tube for fixing one end of the reflector. 1) Make move up reflector down through the second telescopic tube. Get the focal point as small as possible, then tighten the screw, thereby blocking the second telescopic tube. low to obtain the focal point as specific as possible. then tighten the second screw. - Set the pan on the cooking place and open the valve. - The use of pot in highly conductive material (eg aluminum) and with a thick base avoids burning the food in the center, where the heat is greatest. - The outer base of the pan should be black to absorb sunlight. M12 against nut (use two keys 19mm). - The spring on the shutter can be adjusted in the same way. - To clean the reflective surface, dishwashing liquid and a sponge or cloth can be used. Rinse the surface with a drop of dishwashing liquid (so no drop of water remains on the reflective surface).